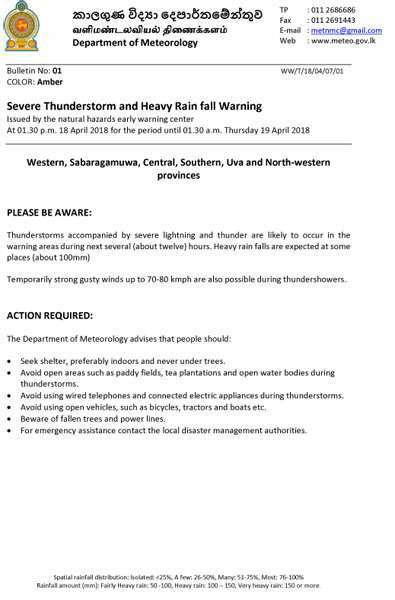 Thunderstorms accompanied by severe lightning and thunder can be experienced in the Western, Sabaragamuwa, Central, Southern, Uva and North-western provinces during next twelve hours, the Meteorology Department warned. The Natural Hazards Early Warning Centre said that heavy rain falls of about 100 mm was also expected in some areas until 01.30 am tomorrow. “There is a possibility of experiencing temporary strong gusty winds of up to 70 to 80 kmph during thundershowers,” it said. When contacted, Met Department Duty forecaster said the adverse weather was a result of the Inter Monsoon conditions. With regard to the current statistics and data, she said the department expects the weather to let up tomorrow.